The Founder of SHARPX talks to us about showcasing his innovative new grooming & styling mobile app prototype in his Kickstarter campaign with the help of Justinmind. This week we got chatting with budding entrepreneur Patrick ‘PJ’ Dunlop about his brand-new grooming platform SHARPX which he’s currently presenting on Kickstarter. The “Netflix for personal grooming” mobile app is a subscription-based solution for users who want more out of their barber shops, nail techs and stylists. We’re revealing all the details about his Kickstarter campaign, featuring his Justinmind high-fidelity mobile app prototype! What’s the best way to present an idea before coding? Well, high-fidelity prototyping of course! 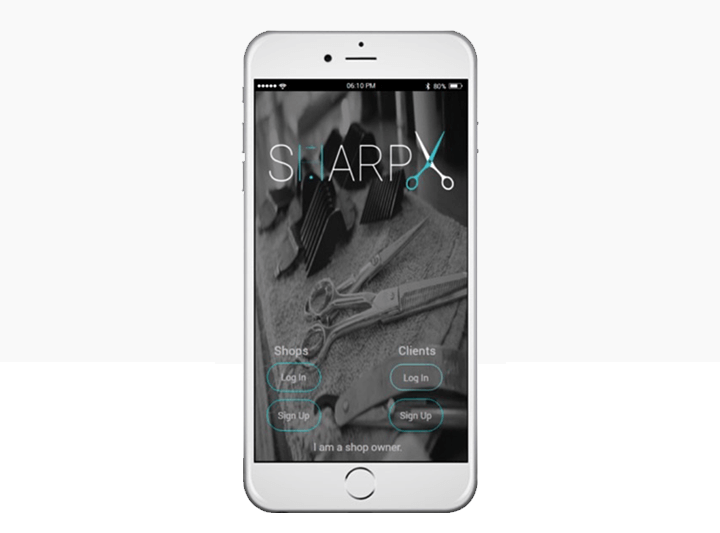 SHARPX intends to bridge the shop-client gap by taking the effort out of your personal grooming routine and making it easy and enjoyable all over again. They launched their Kickstarter Campaign last Friday, June 10th and are hoping to raise $45,000 by Sunday July 24th – thanks to their Justinmind prototype! It occurred to PJ that there was gap in the market for a digital solution to this, and so sprouted the idea. PJ and team have been developing this ingenious idea with Justinmind ever since. The idea behind the app is that you bulk buy a pack of appointment passes and that’s you sorted for a whole month – no more rushed trips to the ATM or unnecessarily high card fees. Pay Once. Book. Swipe. You can use those passes at any participating shop. Swipes renew each month, and the more swipes you buy, the less you pay for each. SHARPX is to be integrated with secure, trusted digital payment systems such as Apple Pay and Samsung Pay. With paper prototyping and sketches, PJ started from the ground up defining the main objectives of the app. Once all project requirements had been determined, PJ began to build up from the core concepts of the app model into Justinmind high-fidelity prototypes that included content, the graphic design framework and finally interaction, with mobile gestures such as swipes and taps. Beginning in January, it took PJ roughly 2 months to get from paper to high-fidelity models of the app with Justinmind. Download Justinmind today and create awesome mobile app prototypes! Without prior mobile UI or prototyping knowledge, PJ was able to learn how to use Justinmind quickly and easily, iterating until he eventually came up with the final prototype, now on display to view and interact in the Kickstarter campaign. He tells us that he found Justinmind to be so intuitive that he was able to change core elements of the user interface in just a few clicks – something that was of great value up against the clock. Once a prototype is underway, Justinmind offers its users various ways to present it to team members and independent parties, such as potential investors or external developers. In PJ’s case, he chose to present his work to the rest of the team on the actual device, which gave them all a better idea of how they could hope their final app to look and work. PJ’s teammates were also able to review the app themselves, so that they could leave feedback and play around with it at their pace. PJ loves the fact that changes can be made and seen by all instantly by using our Commit All option available through our Teamwork features! When the Kickstarter campaign is done, SHARPX plan to outsource the app development. With the help of Justinmind, PJ was able to invite the external software development team to view the app through a private link via email so that they could give PJ an accurate estimate for the next steps of the process. PJ has also been using our public link to show the prototype to interested parties, including potential investors. PJ loved the Justinmind Events system, which allowed him to include smart animations and triggers as well as smooth swiping mobile gestures in the app. Our tutorials helped PJ to create a scrolling effect in the mobile app prototype, as well as an input form with a keyboard optimized for typing in different fields, such as a Name (letters), email address (@), or Cell (numbers). See more on our input UI elements here. Input fields with required fields help to ensure that the user fills in all necessary fields in input forms. With Justinmind’s scenario simulation feature, PJ can guide the user through the possible navigation flow of the SHARPX app. He wants to be able to show customers how quick and easy it is to book an appointment and buy swipes with SHARPX. Washington D.C. PJ leads his team with over seven years of experience in Project Management and Scheduling for Enterprise IT contracts with major Software players such as Microsoft, Oracle, and SAP Software Solutions. His modest team, with a breadth of knowledge in Product Design, Branding, and IT security consulting, has partnered with the software development experts at West Agile Labs to fine tune SHARPX v1. PJ is joined by Chief Technical Officer and resident Programmer Derrick, and Graphic & Brand Designer Takeia, responsible for the graphic elements and branding of the app. Plans for development of the mobile app prototype are already afoot, with the launch scheduled for December. Once the business model is finalized and the beta app launched, PJ and team are hoping to expand their target base to hair salons, tattoo parlors, and shops worldwide. We’re excited to see how their plans unfold and you should be too! Making an app prototype with Justinmind and want to tell us about it? We’d love to hear from you!